Good morning everyone! I hope your holiday season has been a lot of fun so far. It's hard to believe that Christmas is just a few days away at this point, but then again, every morning, my munchkin counts on the calendar how many days are left until Christmas, so I'm kind of hyper-aware of how quickly time is disappearing. Thank you for all of the fabulous birthday wishes! I had a wonderful birthday on Monday, and even got a belated birthday present yesterday - my sewing machine is all cleaned up and ready to come home this morning, yay!! I can't wait! Now that I've wrapped all of my Christmas presents and baked all my Christmas cookies, it's perfect timing. Commenter #19, A.J. Dub of Harriet Homemaker Strikes Again!! Congratulations, A.J.! I'll be emailing you today for your address details. Thanks to everyone for entering and for all of the happy birthday wishes. And because I can't share a post without a photo, here's a snap from yesterday's marathon Christmas cookie decorating session with the munchkin. This is the first year I've let him help me - I'm a bit of a control freak when it comes to cookie decorating, and in past years, I've decorated my sugar cookies with royal icing. But that's definitely not kid-friendly (though it is beautiful! ), so this year we went with some plain buttercream frosting and lots of fun sprinkles. The munchkin had a ton of fun, and my blood pressure didn't go through the roof or anything. I just turned on some of my favorite Christmas music, The Muppets & John Denver's A Christmas Together , and tried my best to keep my cool. He did a great job, didn't he?? He loved those super hard colorful non-pareils best, but also loved dumping various colored sugars on the cookies. It was a lot of fun working on these together, and will be even more fun to share them with our friends and family. 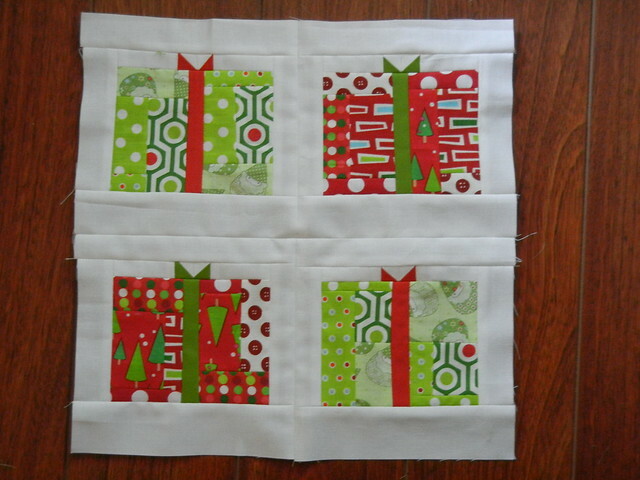 Welcome to my little corner of blogland for my block in the 12 Days of Christmas Sampler Quilt Along! Thanks, Sara, for asking me to contribute! 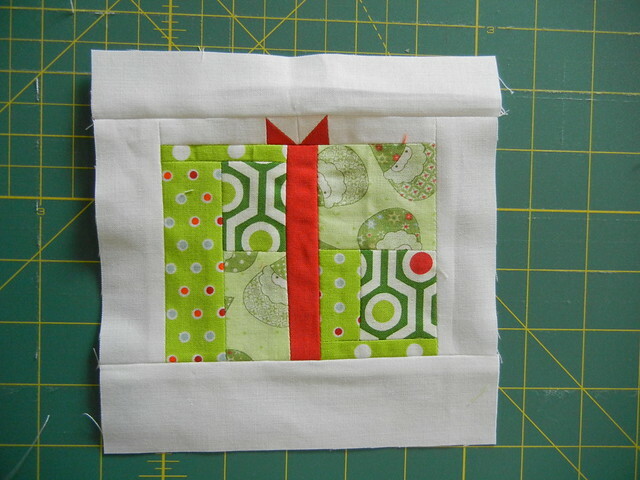 Today, we'll be making a cute present block, which I've called It's All About the Presents. I can remember, as a little kid, obsessing about presents at Christmastime. Despite our often bumpy family finances growing up, my parents always managed to make Christmas memorable. In our house, Christmas meant a lot of things - it meant making Christmas cookies with my mother, attempting to Christmas shop with my father who despised shopping, wrapping presents in a way that would make Martha Stewart proud with my mother, waking my dad up on Christmas morning when I inevitably, as the baby of the family, woke up at 6am. Christmas really isn't all about the presents, it's about family...but it sure is fun to wrap up some pretty presents, especially with fabric!! Let's get to some sewing, shall we? 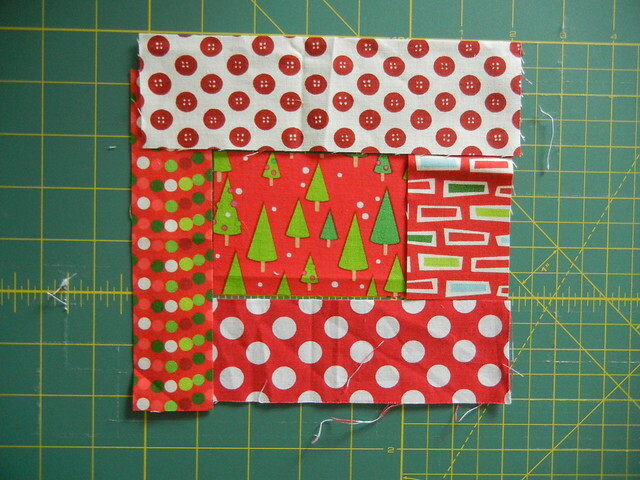 Note: You will use a 1/4" seam for all piecing in this block tutorial. 1. Start by ironing your scraps and sorting them by size and color. You'll be making two rectangular log cabins from each color. First, find a rectangular piece you'd like to feature in the center of your log cabin. It should be approximately 2" x 3". 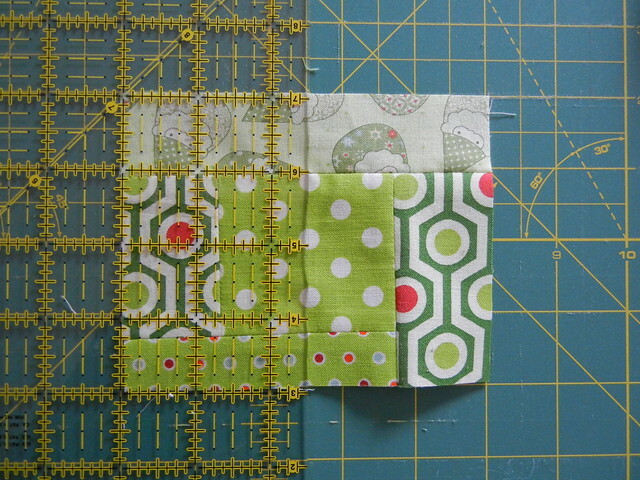 Next, find coordinating scraps to go around your rectangle, with various widths for visual interest. My narrowest width in the block below is 1.5", and the widest is 2.5". 3. Next, bring your log cabin over to your cutting and mat and trim it down to 4" tall by 5" wide. Find the center point of the width your log cabin, which would be the 2.5" point. 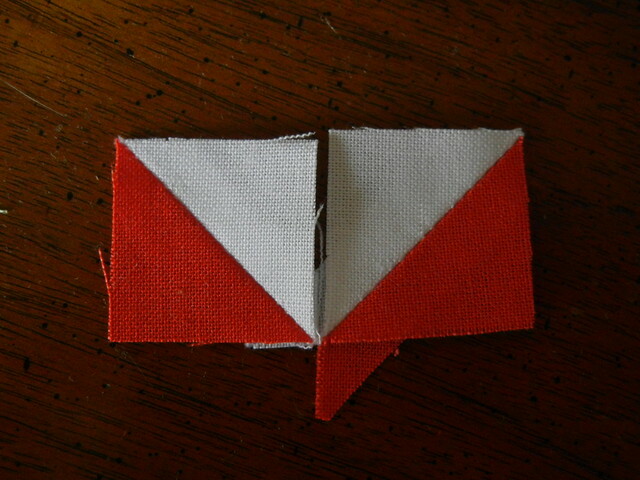 Cut down the center, creating two pieces measuring 2.5" wide by 4" tall. 4. Let's add in a strip of ribbon. Take a 1" x 4" strip of a solid holiday color and seam it to one side of your halved log cabin. You can then flip the other side of the log cabin over, to create a different patchwork look to your present before seaming it to the opposite side of your ribbon. Press seams open. 5. To create the ribbon at the top of your presents, take one neutral 1.5" square and pair it with a 1.5" square of your ribbon color. Draw a line down the diagonal center of your neutral square and place right sides together with your ribbon square. Seam a scant 1/4" seam on either side of the line you've drawn, and then cut down the line to create two HSTs. 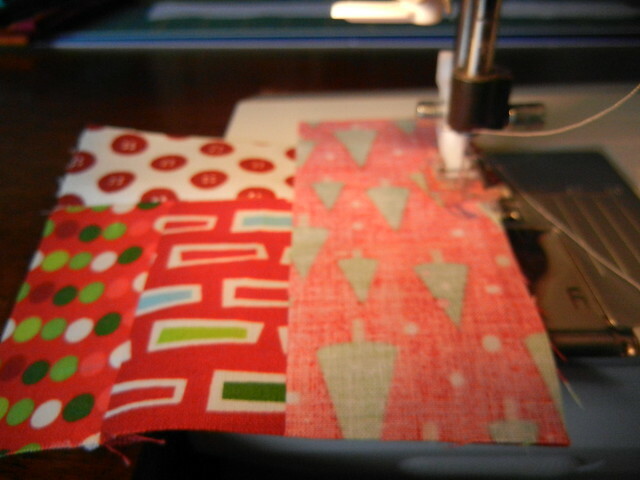 Press seams open and then trim each HST to a 1" square. 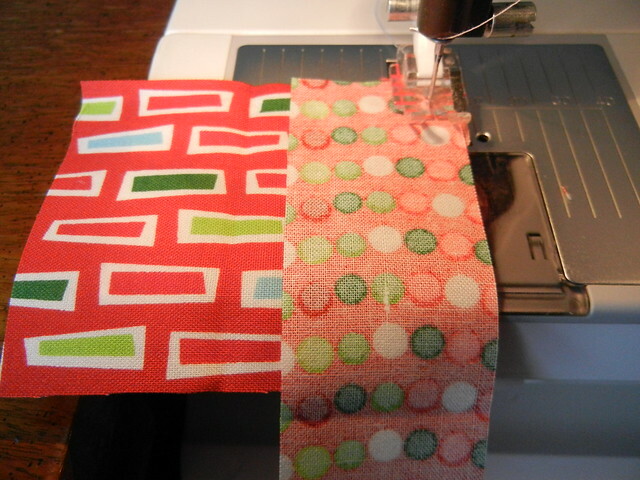 Take your two ribbon HSTs and place together as shown below. Seam together. Next, cut two rectangles from your neutral solid, measuring 1" x 1.75". 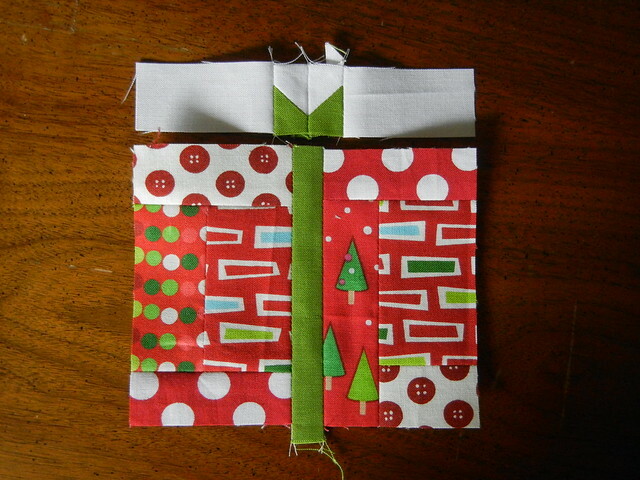 Seam one on either side of your ribbon to create a strip of ribbon 1" x 5" to go on top of your present. 6. From your neutral solid, cut one 1.25" x 6.5" rectangle (for the top of your present), one 1.75" x 6.5" rectangle (for the bottom of your present), and two 1.25" x 4.5" rectangles (for the sides of your present). 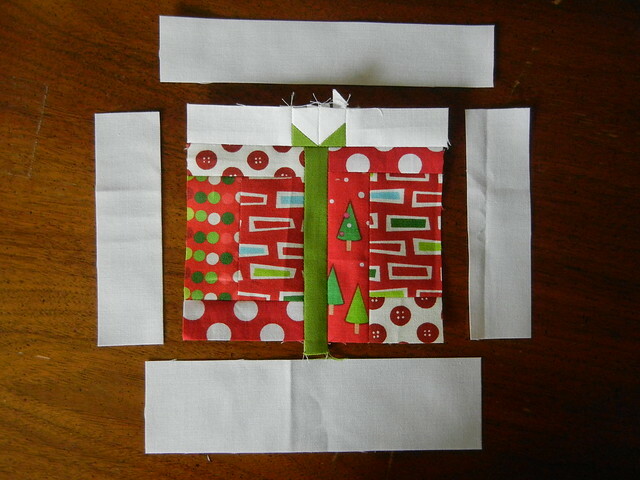 First, add the side neutral rectangles to your present. 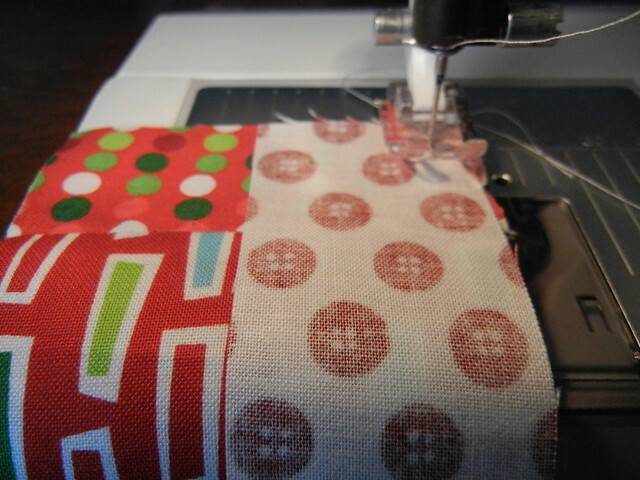 After you press seams open, add the top and bottom rectangles, making sure to use the skinny one for the top. Repeat steps 1-6 for the other three quadrants of the block. 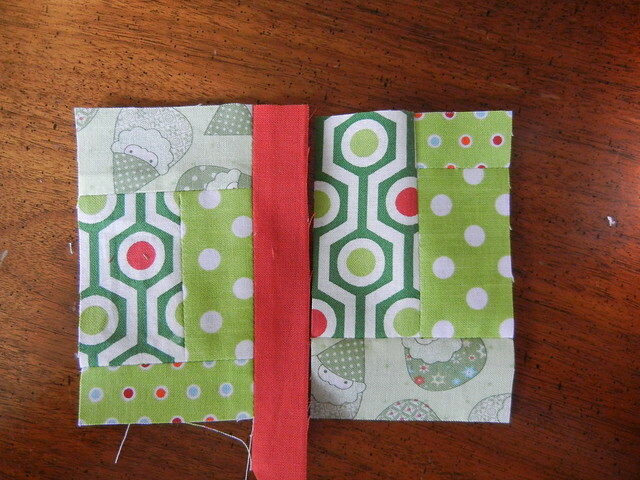 Place your four mini-blocks in an order you're happy with, then seam each right/left pair together. Press seams open, and seam each row together, pressing your final seams open, creating a complete 12.5" block. I hope you enjoyed this little block tutorial, I had a lot of fun making it for you. 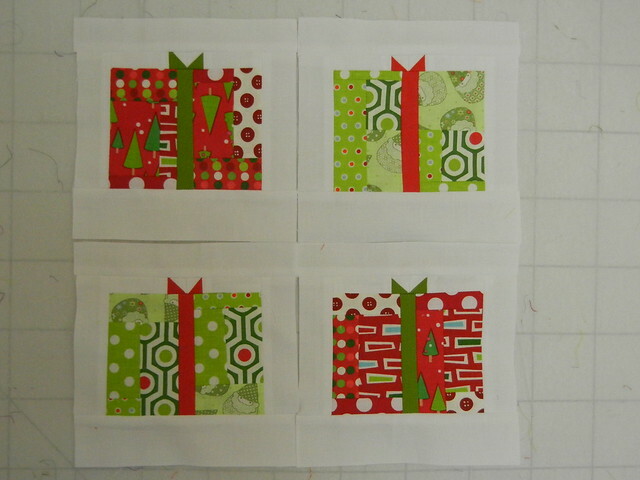 Don't forget, there are still plenty of days left in the 12 Days of Christmas Sampler Quilt-Along. Here's the schedule for the quilt-along, and I do hope you'll join in! Merry Christmas to you and happy sewing!